Each day, in each country, a housefly is born. Lots of houseflies really. Houseflies have been being born around us for thousands of years. They are born of what everyone else abandons, corpses, cakes, and excrement. And yet their story is inescapably a version of our story. They spread early out of Africa, bound to us. You find them wrapped in mummies, their bodies held tight against the bodies of pharaohs. You find them in ancient latrines, as larvae, tunneling through what we would rather be done with. At picnics they sit on hot dogs. In bedrooms, they look down from walls. In war and tragedy, they mouth what we cannot even countenance. They brushed upon Gandhi, Mother Theresa and Caesar, but also Mussolini and you. And before they brushed upon you (or Mussolini) they brushed upon, well, you don’t want to know. Actually, you might want to know. Or at least some scientists think you might want to know. So it is that there is now a large book worth of scientific studies of just what can be found living on flies. All of these studies are interesting, some are a bit disgusting, and a new study from a pig farm in North Carolina is the kind of thing that might just change how you live your life. 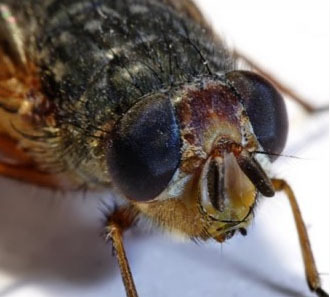 Although we have seen houseflies for millennia, complained about them in a thousand languages using a hundred thousand adjectives, in some ways they are still among the least known guests at the table. No one knows where they come from (only that they had already found us as of five thousand years ago). No one knows what they did before they found us (though one imagines it involved decay). What we do know about houseflies is that they gather a little bit of life from everything they touch and redistribute it, a sort of Robin Hood of germs.